So it was Father's Day a few weeks ago and I was stumped for a present. Normally in this situation I'd buy him a nice bottle of wine, write a card and consider that a fair exchange for 26 years of his support, generosity and commitment to keeping me alive. Unfortunately, as my folks live in France nowadays, sending them a bottle of wine is basically just a waste of stamps. No worries though, this year I had a better idea. Dad was getting some chili chocolate bacon. Now THAT'S a fair exchange. There's very little in the way of a recipe here. Cook some streaky bacon off until it's proper crispy, American style then pat it dry with paper towel. I don't get how some people say they prefer crispy bacon and then some say it's got to be a bit meatier like how us Brits eat it. It's BACON. However it comes it's AWESOME. Dark cooking chocolate. Ermmmm about 300g? Break it up and stick into a heat-proof bowl. Add a tablespoon or so of lard or shortening and melt over a bains-marie. 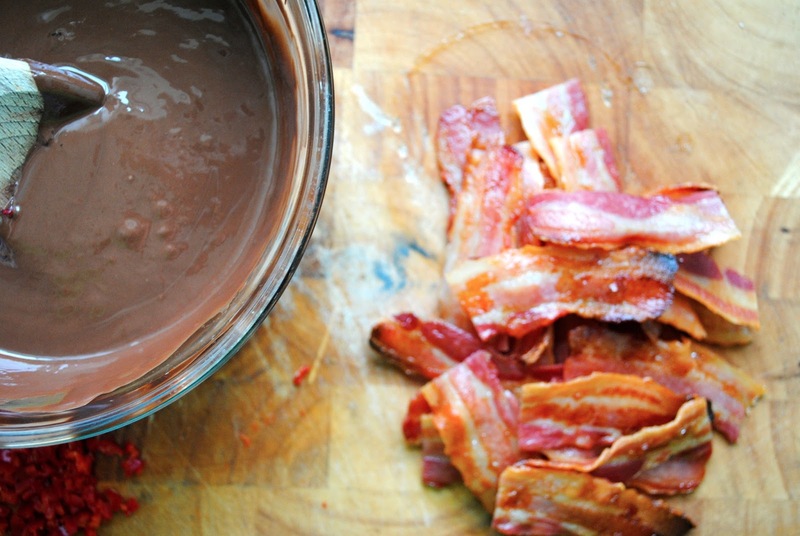 The lard will give the chocolate a nice shine, and it's not as if the calorie count means anything at this point. 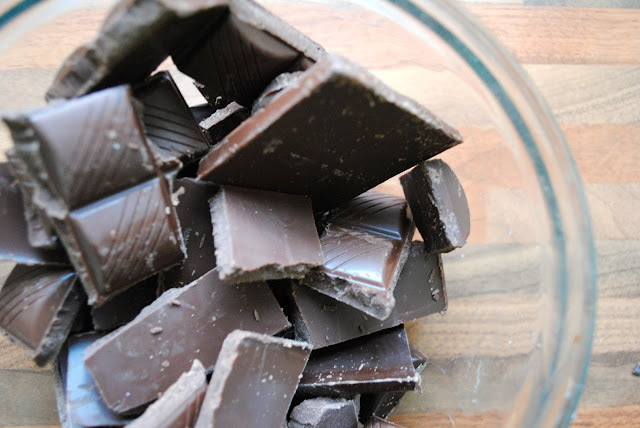 Finely chop a red chili and stir half into the melted chocolate. Cut the bacon slices in half widthways. It's best to do this whilst the bacon is still warm, so as not to break and crack the slices. What you've got there are basically the best crisps in the world. Holding the bacon by one corner just dip in the melted chocolate, shake off the excess and then lay on baking parchment. Sprinkle with the chopped chili for a little bit of ridiculousness. A sprinkling of sea salt gives you full-on absurdity. Now then, plenty for Dad and a few leftover for the chef. Bang into the fridge 30 minutes or so until the chocolate hardens. And there you have it. 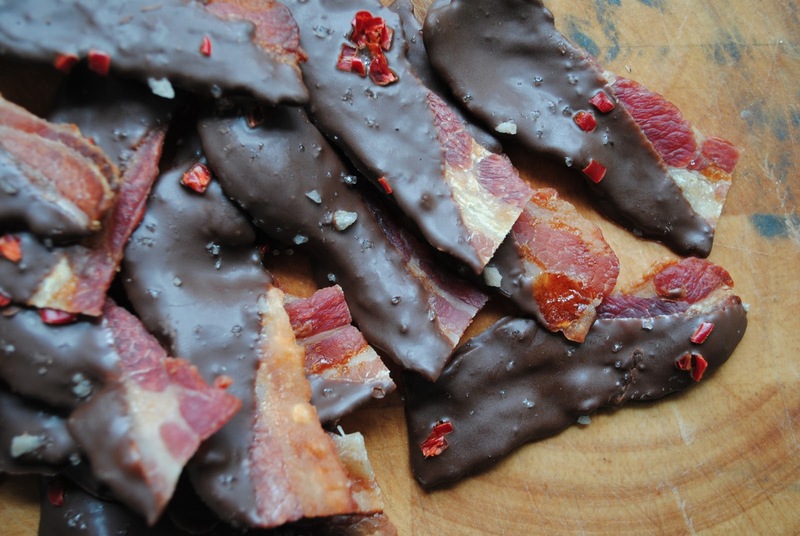 Chili chocolate freaking covered bacon. Might sound mental, but it really works. The saltiness of the bacon with the bitter chocolate and the kick of the chili, it's a true tastegasm. Give it a go man. Send some to your Dad, he deserve it. I'm also sending my Mom some white chocolate pretzels. Basically because Dad won't share.